Worldwide advertising agency network, BBDO, focuses on the work ahead of all else. Originally founded in 1891, it’s the mastermind behind award-winning campaigns like Snickers’ ‘You’re Not You When You’re Hungry’ and Pedigree’s ‘Feed the Good’, both of which were shaped by an impactful insight into their respective target consumers. Using consumer insight to inform campaign strategy. BBDO is no stranger to using data to inform campaign strategy. 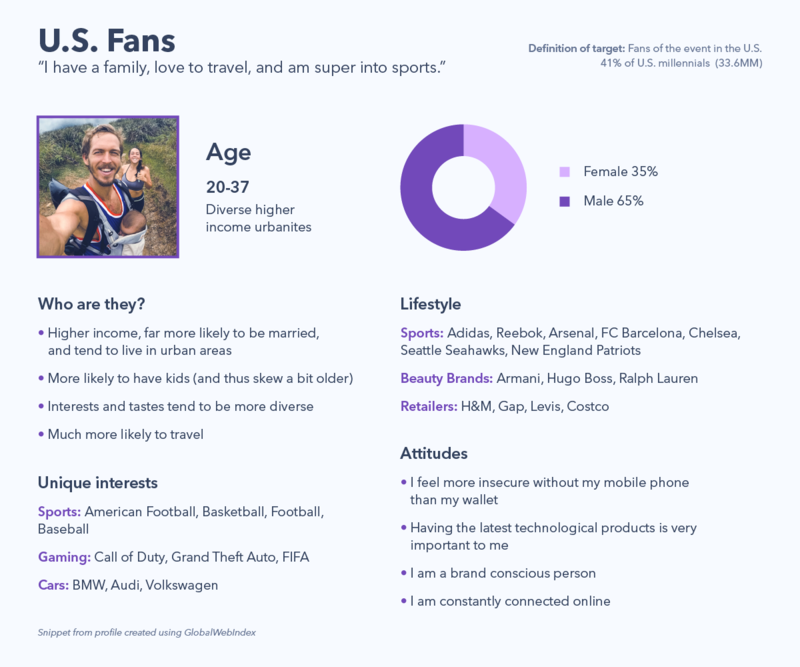 So when a leading client in the financial sector was looking to target fans of a global sporting event, consumer data was a crucial starting point. As with many brands in their sector, the challenge was to change the way people think about using various methods of payment abroad and at major events. “The aim was to get people to feel comfortable and confident when they travel, and to see this brand’s services as a better option to facilitate transactions. This confidence and ease of use meant they would no longer miss a moment of action”, says Chris Daniele, VP and Director of Digital Analytics and Measurement Lead at BBDO NY. This is where consumer insight came into play. Identifying the motivations behind the actions. 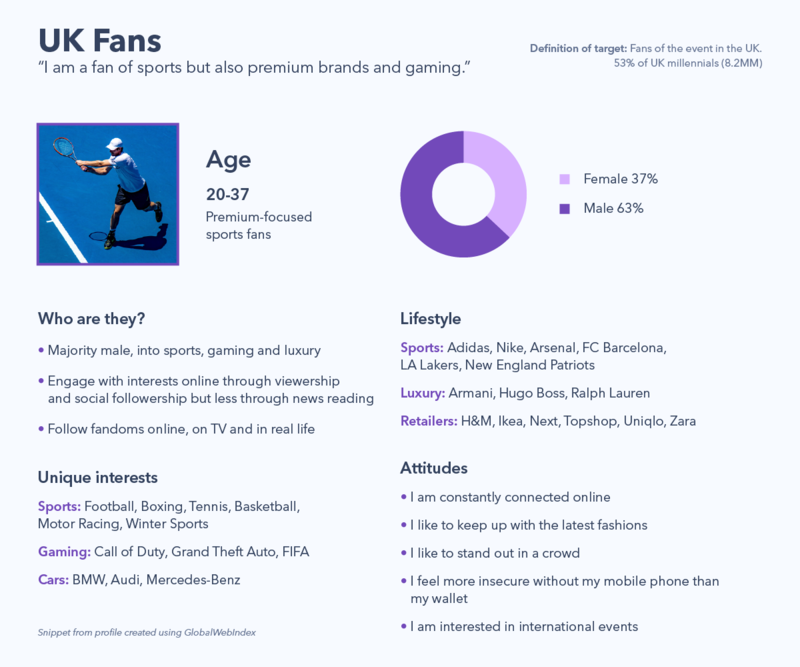 The team started by using GlobalWebIndex data to develop different segments of fans in key markets, based on behaviors and needs. Starting with a U.S.-based audience, the team then expanded their search to include a global view and ensure there were opportunities across the board. Using GlobalWebIndex, the team could analyze far more than just the demographics involved. “Being able to examine who these people are and how they behave is where the value lies for us”, says Chris. “Even if you identify an audience segment as being a millennial sports fan, they’re not all the same people. Once the attitudes behind their target audiences’ behaviors and levels of brand trust were identified and confirmed, the team could build out the campaign with confidence. The brand will help fans overcome FOMO, whatever shape or form it will take, with speed and ease. It successfully challenged common misconceptions target audiences had around traveling, moving their opinion away from worrying about the risks associated with transactions in global markets to placing their trust in the brand and its unique offerings. Without GlobalWebIndex, Chris says the campaign would not have been such a success. BBDO continues to use this data to inform leading campaigns and strategy, and measure their impact, equipping the teams with an in-depth knowledge of their global audiences. This, he says, is central to solidifying your status as a data-driven agency in today’s landscape. “As a data-driven agency, we can’t lead out there without doing the leg work, development and strategizing, while also making sure our findings are valid, accurate and applicable.